Growing up a Walt Disney World vacationer in the 1980’s was truly a gift. We got to experience Mr. Toad’s Wild Ride, Snow White’s Scary Adventures and the first (and greatest) version of Epcot’s Journey Into the Imagination. Thanks to an outstanding artistic and writing team at Marvel’s Disney Kingdoms, we can relive some of our childhood through their highly successful new comic, “Figment”. This series is already so popular that Marvel did not print enough copies of the first issue to keep up with demand. I had to place an order through our local comic shop for the second printing and received my copies of issues #1 and #2 today…and may or may not have torn into them as soon as I arrived home. In the first issue we are introduced to Blarion Mercurial, who was known as the Dreamfinder in the original ride at Epcot. Mercurial has been actively experimenting with ways to harness new sources of energy, per the demands of a tyrannical Chairman at The Academy Scientifica-Lucidus in London. Issues arise, however Mercurial is set on discovering energy through brain power. Our favorite little Disney sidekick appears in this issue as well and entertains and enlightens. I don’t want to give away too much about this comic series. There are several nods to the original ride in the issue and the steampunk edge of the artwork is really something special. The storyline is interesting and headed into an unexpected direction. Fantastical would probably be the best word to describe the comic series. I would say this is a must-read for any Epcot fan or those who enjoy a good sci-fi comic series. 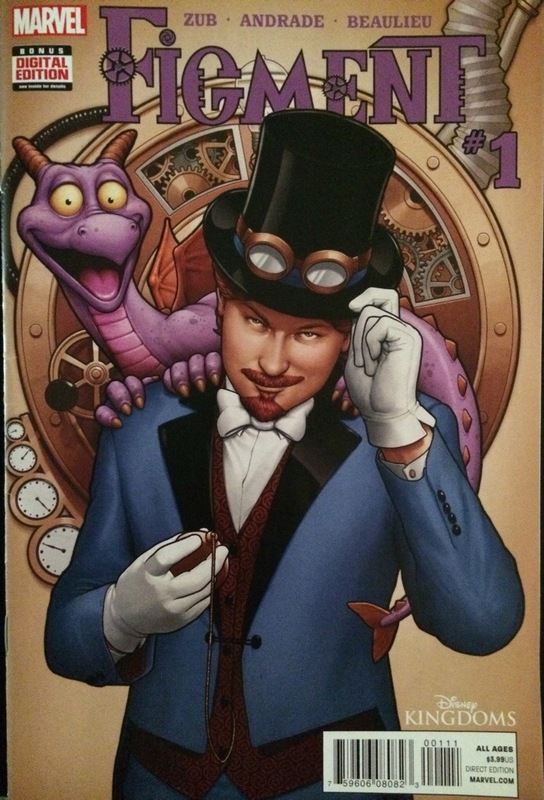 This entry was posted in Uncategorized and tagged Figment Comic, Figment Comic Review. Bookmark the permalink.